Now we move onto a truly pretty element of the wedding: the bouquet. Today I’ll only be talking about the bouquet decoration. As weddings become more original and couples take more charge with their own DIY touches, each detail of the wedding is becoming more ornate and thought out. Proof of this is that bouquets themselves have decorations now. They can span from simple white satin ribbon enveloping the flower stems or more intricate designs including feathers, pearls or photographs. Designs are differing greatly as originality and uniqueness abound. No matter what though, the overall trend is a return to classic elegance and intricate, yet simple designs. It’s a rejection of clean cut modernism and a new emergence of old-fashioned simplicity and delicate beauty. One piece finding its way into the majority of bouquet adornments is jewelry. This is a wide field, but because it is a classy occasion, usually only high-end and sentimental jewelry is used. A classic item now being repurposed for the bouquet are pearls. They make for a beautiful decoration that match any color and most designs. Obviously, it would be hard to pull them off with fabric such as linen, but anything is doable if you use some ingenuity and true design expertise. Another classic and sentimental element returning is the brooch. I think I love this adornment the most, because it can work on any color and on minimal or ornate designs. It’s also an old-fashioned touch that never goes out of style and a perfect way to add your ‘something old’. A new way of incorporating jewelry into bouquets is to simply tie a small bracelet around the bouquet. It can be gorgeous if done well. Bracelets with hearts dangling from it around your bouquet will only add to the sweetness of the day and the simple elegance of the ceremony. As originality increase, so does the use of new decorations. One design beginning to become popular is the use of feathers. 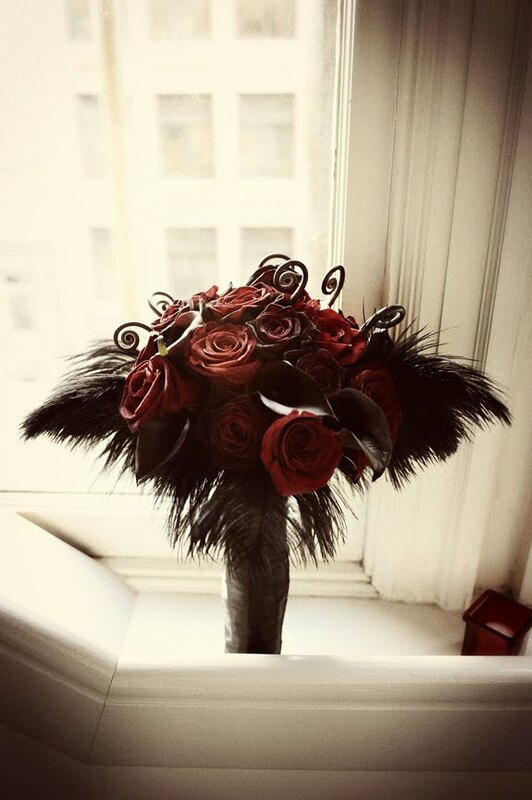 This is a new and truly unique bouquet design, and actually has quite and old-fashioned feel. It beckons the feel of the days when boas and feather headbands were popular in the 1920’s. For a very classic elegant feel, this is a great option. Lastly, no matter what the theme of your wedding is, be sure to include the season into your motif. 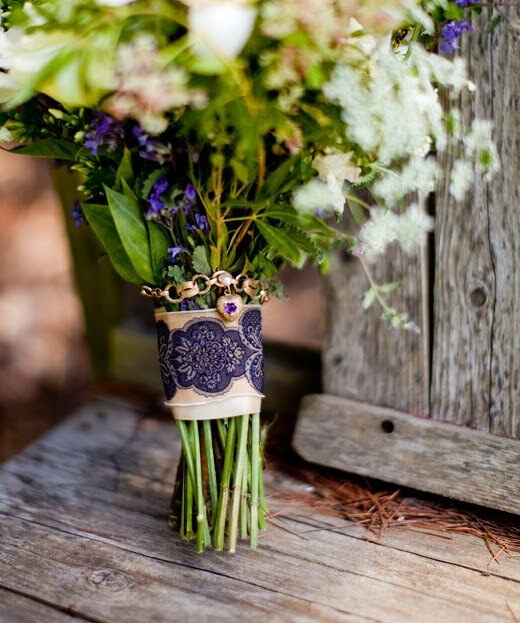 If you incorporate your bouquet in this, use elements specific to the season (and possibly the location). For spring, use flowers that are in bloom. For summer, a homey, unique option is to use small amounts of wheat. For fall, use leaves changing colors or dark berries. And for winter, consider using pine branches, ornaments, or ivy. The season doesn’t need to rule wedding motifs, but it shows consideration for your date and location to use elements of both. Bouquets are one of the details of a wedding that is entirely the design of the bride, and is becoming a showcase for her personality and style. Use ideas, but truly use your originality to make them your own, and just remember that white and elegance never go out of style. Want to see your wedding highlighted on Inspiring Pretty? Just submit it to us for review here. Then be sure to check out our new Wedding of the Week every Saturday!